Weighing in at close to 5,000 lbs, Hyundai's luxury division Genesis G90 is a reminder of how comfortable and accommodating a posh full size sedan drive and ride experience can be. But can a non-hybrid car this large, this posh, also be fuel efficient and sport-drive-competent? Hyundai's flagship 2017 Genesis G90 is just a tad mind-bending large. It’s BMW 7-Series large, and borrows more than one design cue borrowed from Bentley. 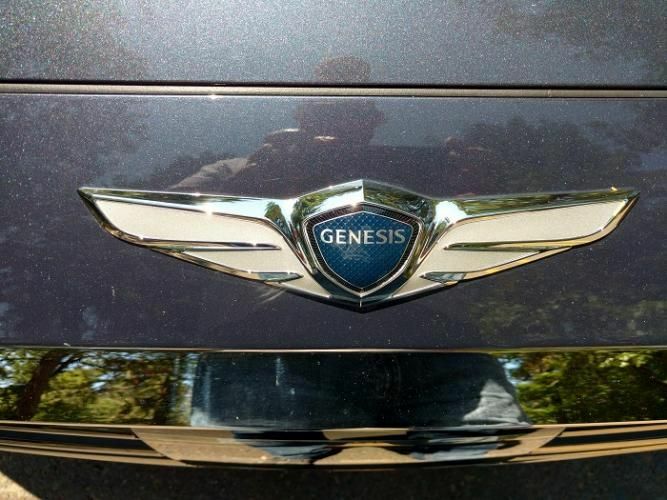 Genesis competes in the luxury full size segment, and does so measurably well for $ thousands less than a comparably equipped competitor without compromise of driver and passenger accommodation, personal electronic connectivity, fit, finish and measurable engine power. Not ready for Genesis. Check out the all new Kia Cadenza. This initial visual perception of “huge” may be the result of car manufacturers pushing mostly midsize-”near full size” cars and SUVs on the driving public. In this case, there’s no question about it -- 2017 Genesis is a super sized sedan. With a grill to tail measurement exceeding 17 feet, Genesis is targeted at the premium full size sedan buyer searching for a fully equipped luxury car bargain riding in the good company of Audi, BMW, Cadillac, Infinity, Lexus, Mercedes Benz and Lincoln. While not the most fuel efficient or engine powerful in the class, US News and World Report ranks 2017 Genesis #2 in the premium full size sedan segment, right under Tesla S. Surprising? Yes and no. Presenting inspiring, classic, luxury car good looks, full size luxury car comfort and accouterments, 2017 Genesis comes to a lofty, most discriminating, luxury car segment with the most comprehensive, inclusive list of standard comfort, active safety, and personal electronic connectivity and entertainment in the industry, and does so for well under $70,000. With 2017 Genesis, what you see is what you get: Outside of an available V8 engine uptick, and a reasonably priced all-wheel-drive option, the base trim MSRP ($68,100+) Genesis V6 comes to market with near autonomous driver assist, collision avoidance technology, color surround view camera capability, 21-way Nappa leather clad power adjusted, heated and cooled driver’s seat, acoustic glass, and thick carpeted road-noise deadened surfaces for exceptional interior quiet, adaptive drive-mode- selected suspension tuning, and one of the best working entertainment navigation center stack static touchscreen interfaces in the industry -- resulting in a near intuitive seamless quality and operational excellence. The most under appreciated luxury hybrid in America may be this car. The touch and visual sensory of G90’s cabin confines is reminiscent of a bygone, no-holds-barred automotive era, complete with real wood accents, brushed metals,a suede-like headliner, leather stitched dashboard, and contrasting color pipped seating, With automated adaptive dampening, drive mode selection, and (arguably) the quietest cabin in the segment, G90 proves to be an exceptional fatigue-free highway cruiser. In-fact, standard equipped with near autonomous driver assist and collision prevention technology, 2017 Genesis G90 quite literally steers itself while driving down the freeway. I trully appreciate the adaptive cruise control -- more than once bringing Genesis to a complete stop, and resume, in ‘stop and go’ traffic. Lane keep assist, front and rear traffic monitors, stability control, intersection watch via G90’s exceptional 360-view cam and color monitor, and a concert-hall-sound that melts the drive hours away into insignificance. During our week-long drive review, Torque News logged 900 miles on Genesis under variable weather and road conditions. But, can Hyundai's Genesis G90 flagship perform with the likes of Audi 7 on a twisty 2-lane while recording reasonable fuel efficiency? In short, yes! Genesis V6/V8 engine options: In today’s world of high output 4-cylinder turbocharged engine wizardry and 8 to 10 speed dual clutch transmission electronically controlled wizardry,, Genesis presents a very civilized twin turbocharged 3.3 liter DOHC (dual overhead cam) 24 valve, cylinder managed V6. Looking under the heavy-weight sound deadened Genesis hood, one finds an old-school, strut stiffened and supported diagonally mounted V6. Rear wheel drive: There is no FWD (front-wheel-drive) trans axle crowding the engine compartment. 2017 Genesis G90 is rear wheel drive, resulting in uncluttered, easily access to all fluids, drive belts , etc. Love it! Thanks to constant variable timing, intake management, and direct fuel injection, G90, while producing 365 peak horsepower at 6,000 rpm, and an astounding 376 lb-ft torque from a bit off idle throughout the mid range (1300 to 4500 rpm) is very impressive as to spot-on acceleration, no-shift grade climbing, and very quiet, low rpm, 70+ mph freeway cruising. In-fact, Genesis is so quiet at highway speeds , that one may be compelled to check the instrument cluster for signs of a running engine. Erie! Yes, one can opt for a higher horsepower V6 option, but in my most humble opinion, the torque-happy V6 is the engine of choice. In the ever evolving world of “green,” Eco-conscious automotive engineering, 2017 Genesis G90 is a bit of a regressive anomaly -- you’ll find no electric/gasoline hybrid here -- and fuel economy, although acceptable on the highway, is not best in class. But then again, G90 unabashedly targets the rarefied world of the $100,000 plus full size luxury car segment, and does so without compromise. At the end of our “week in the seat,” we found and average MPG of 25.9. Granted, most of our extended drive was conducted on the freeway, But then again, for a mega-car tipping the scales at 4700 lbs, running more creature comfort electronic systems than a private jet, fuel efficiency proved to be surprisingly reasonable. I recommend taking a hard look at Genesis to any buyer considering the purchase of a full size luxury 4-door sedan. With 2017 Genesis, what you see, is what you get, a non compromised, pleasurable drive and ride experience, and an easy, nothing hidden, build and buy experience, warranted for 10 years/100,000 miles. What we like: Great premium look, fantastic wheel design, intuitive driver to car connectivity, a very comfortable, Nappa leather covered driver’s seat, powerful twin-turbo V6. What I would change: Improved in city fuel efficiency, reduce body roll through the sweeps, improve multiple phone brand connectivity,standardize power adjusted rear seat and all-wheel-drive. Add 2 to 3 inches to power steering wheel adjustment for taller drivers. With all respect, if your looking for better gas mileage, I suggest you get a Vespa scooter. I don't get it RBH, what's up? Please expand on your comment. Cheers! What is Hyundai Doing with Genesis Overseas? How Does Genesis Stack Up in Latest J.D. Power Rankings? Can The 2017 Genesis G90 Top The Rest In The Luxury Car Market?